Delegated by President Bashar al-Assad, Minister of Presidential Affairs Mansour Azzam visited on Monday heads of Christian denominations and conveyed to them congratulations of President al-Assad on the occasion of Christmas. Minister Azzam visited Greek Orthodox Patriarch of Antioch and All the East John X Yazigi, Syriac Orthodox Patriarch of Antioch and All East Mar Ignatius Aphram II, Patriarch of the Melkite Greek Catholic Church Joseph Absi, Syriac Catholic Church Archbishop Elias Tabi, Armenian Catholic Bishop of Damascus Jospeh Arnaouti, Pastor of the Evangelical Church of Damascus Rev. Boutros Zaour , Archbishop of the Maronite Church Bishop Samir Nassar , Parish Priest at the Latin Monastery in Damascus Father Bahjat Karakash. 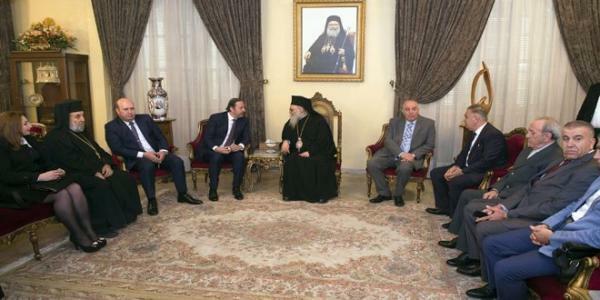 In turn, the heads of the Christian denominations expressed their thanks and appreciation to President al-Assad for his generous gesture, invoking God to protect Syria and its people.